As a self-confessed Costa Coffee addict, I was never going to pass up the opportunity to visit the new food-led concept store that’s just been opened. Introducing: Costa Fresco. Costa Fresco has opened up on Tottenham Court Road, ideally placed to feed the hundreds and thousands of workers nearby. It’s a bold move on behalf of the coffee giants who have transformed one of their existing Costa Coffee branches into the different-looking Costa Fresco branch. The colour scheme of the store is completely different to Costa’s normal red colouring and has been deliberately picked to allow for a more relaxing feel. 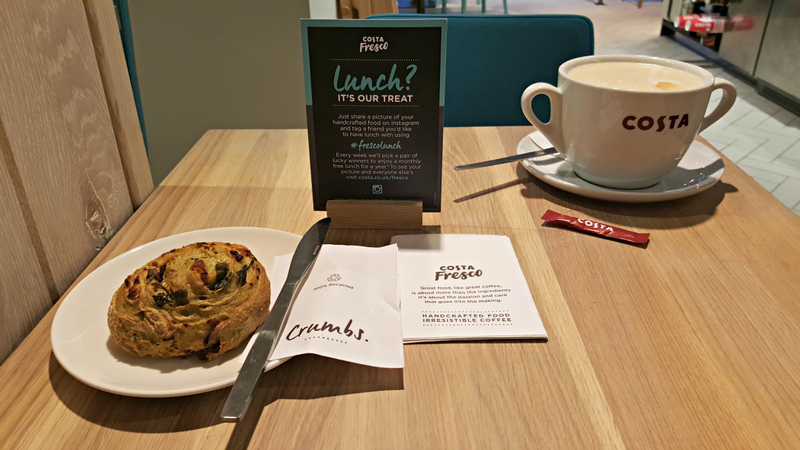 There are designated areas for relaxing in the store, and apart from the coffee and some of the food items which you’ll see in every Costa store, the only thing that was recognisable was the tables used. Even the chairs are different to the standard Costa stock. Described on their website as “a new concept store offering a unique menu of handcrafted food alongside the irresistible coffee you know and love.” it goes little way to describing what the store actually offers. Calling the menu “unique” may be pushing the boundaries of the term, but it’s true that there is more to offer than the standard coffee store. They’ve also moved more technology into the store, primarily the menus which are now electronic rather than card. The whole store looks smart, clean and relaxing, which seems to be the exact vibe that Whitbread were after. 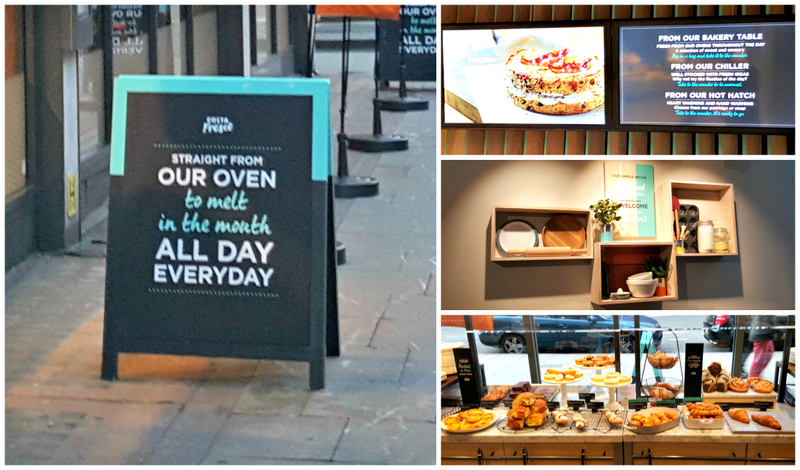 The unique food on offer is freshly baked - an apparent throwback to the original Costa stores where freshly baked pastries were offered - and it moves this store from a coffee shop to more of an eatery. I chose a goats cheese and pesto ciabatta swirl with my coffee, and it was superb. Don’t be fooled into thinking that coffee isn’t still central to their plans, though. The fact that they have three barista stations ready to make your espresso-based drinks shows that they expect a high footfall wanting hot drinks. Compare that to even busy Costa Coffee stores who normally have two machines rather than three as a maximum. The third of the barista stations. I’m not surprised that Costa are trying this new venture in an attempt to capture more of the market, though I have to question whether it is a move that needs its own brand. Costa Fresco is a great idea that is well-presented. The food, although sometimes pretentiously named, tastes good and is probably better for being freshly baked rather than shipped in cold and heated up. There’s also little doubt that it will be busy, especially in London where it sits among throngs of similar shops with similar offerings. I suspect that you could put a tent on the road and sell sandwiches and you’d still do rather well given how many people are around. It will be interesting to see whether it translates to the UK High Street, though. Some may argue that we don’t need more coffee shops, and the counter from Whitbread would be that this is more than a coffee shop. I don’t think that’s necessarily true. Costa Fresco strikes me as a coffee shop with a different food offering rather than anything different to what we have already. Would I like to see one on the streets of Chelmsford? Yes. Would I be a regular there? No, I’d stick to my normal Costa Coffee store, and that alone may tell Whitbread all they need to know about Costa Fresco. Costa Fresco is situated at 190 Tottenham Court Rd, London, W1T 7LH.